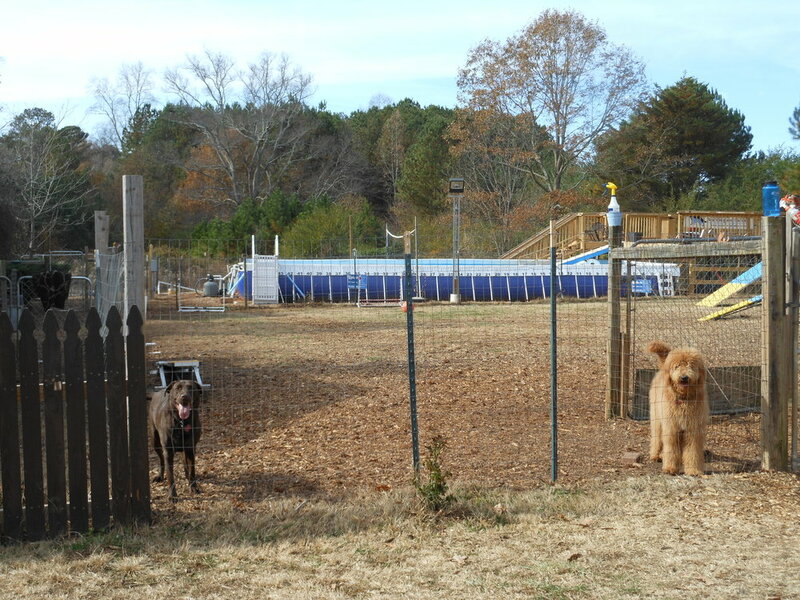 Boarding is held at our farm house, which is also home to dog training and our Academy for Professional Dog Trainers. All services have access to our HUGE 48′ long dog swimming pool where the dogs can enjoy splash & play, aqua therapy, dock diving training, and swimming lessons all at a discounted rate. Dogs who are boarding or enrolled in our board and train program can add on swimming at a rate of $20 for 30 minutes. Our all-inclusive boarding features night time monitoring, doggie daycare, lots of exercise, social activity, and human contact. Our location provides an incredibly stimulating environment for your pup, both physically and visually. Although our facilities are only open from 7am to 7pm, we do have someone on site at all times to let the dogs out at night. We will attend to all medical needs at no extra charge (including giving medication). Our boarding process does require a temperament test beforehand - to schedule one, please call (770) 714-9877. Any size dog, any weight dog! All inclusive fees of $49 per dog. 15% discount on the second dog from the same customer on same visit. Superior supervision of our dog guests by a staff that truly LOVES dogs!!! We love to have the young puppies and older dogs hang out with our staff in our home environment on the farm. Here is a sample break down of other facilities price structure of $25-$30 a day for the kennel boarding. $9 – $15 a day for 15 minute nature walks and extra costs for longer duration. $5 a day for time in the exercise yard alone for 15 minutes. All of a sudden, that $30 a day turns into $45 a day and you get a stressed out dog when you return home. Surprise! We offer a superior value with all-inclusive pricing. We have a limited space so reservations are required in advance. Please call “The Farm” specialty dog boarding at (770) 714-9877. Dogs will live on our farm at the 12900 Freemanville Road location. As usual, the boarding dogs will sleep in crates in the dog room at night but the rest of the time they will be running and playing in doggie daycare or in our agility area with the other friendly boarding dogs. We provide a service that pays attention to the needs of dogs that may require a potty break after 10pm. Atlanta Dog Trainer will provide excellent care for your furry family member. Since we have staff on the property throughout the night caring for the boarding dogs and training dogs, your dog will have specialized individual night and day care. We spend individual time with them by loving, petting, brushing, giving them treat balls and watching “Animal Planet”. We keep them as spoiled as we do our own pups! Our excellent boarding staff is trained to detect and prevent canine stress, administer first aid, and to soothe dogs with any fear-based issues. Baths: Shampoo, conditioner, towel dry $25-$45 depending on weight and hair type.